The favourite priest DID behave secretly during his life and he did become very rich. So, he must have found treasure, right? The speculation about what treasure he found, that of the Visigoths, that of Blanche of Castille, that of the Templars, etc, etc, is still in full spate. 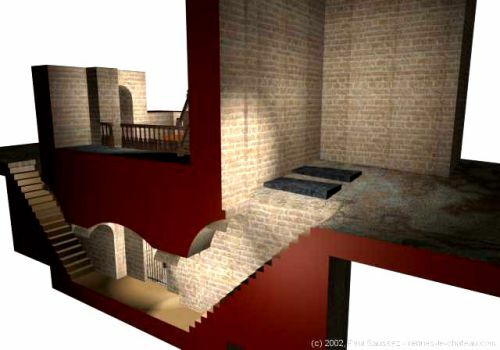 Many people who claim to have discovered the whereabouts of Sauniere's hidden treasure seem to have reached their conclusions after studying the "clues" in Berenger's church of Mary Magdalene at Rennes-le-Chateau. I would like to de-fuse this idea. Look at it this way, if Berenger had hidden what he found, and then left a series of clues so that someone super-intelligent could find the treasure 100 years later, he wouldn't have got rich and spent what he found, so the mystery of his secret treasure would never have arisen in the first place! If YOU found this secret treasure, would you hide it and leave clues dotted about so someone super-intelligent could work out the clues in a hundred years' time and become rich instead of you? Then you would live the rest of your life in poverty, thinking that one day you'd look down from heaven and see someone else get rich on what you'd left them as a reward for being super-intelligent? Of course not, and neither would and neither did Berenger Sauniere. I worked out how Berenger got his money and it is all explained in my book "Mary, Jesus and the Charismatic Priest". It was triggered by something I read in a French local paper, explaining how anybody could make a few pennies, and I suddenly thought; "I BET that's what Berenger did!" While he was renovating his church he went down into the crypt. Apparently he came up again with a pot of coins, told his workers they were simply medallions and dismissed the men early for lunch. They then went to the café and told the world that the cure was being very secretive! Later he gave some Visigothic jewellery to women friends. It does seem that he retrieved something valuable, and it does seem that any excavation of the crypt, which he later blocked up, will not reveal very much, because everything interesting was removed by him. The church as it is today. But the crypt of the church at Rennes-le-Chateau is in the news at the moment after the meeting of the municipal council on 24th August 2012. 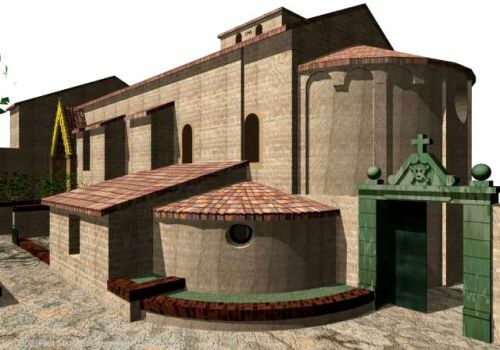 A Brussels architect called Paul Saussez has been officially appointed by the municipality to prepare an application for archaelogical investigations in St. Mary Magdalene's church. Everyone is assuming this means the crypt will be opened and explored. It will take months even to prepare an application, never mind the length of time the authorities will need to study that application, however, we believe a document was presented before the end of 2012. 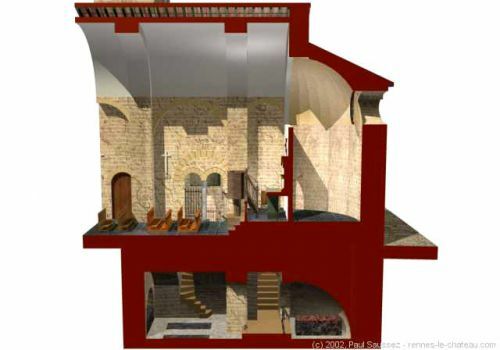 Paul Saussez is known as a Rennes-le-Chateau researcher and in 2002 published a series of 3D drawings of the church. They show the church as it was in 1740 and the changes that have taken place since then. It will of course be interesting for me if the crypt is discovered to be Visigothic, as I believe it to be, along with the crypt of the chateau. They call the church "Carolingian" because the first document about Rennes-le-Château is dated 798AD, and was a report commissioned by Charlemagne. This said that 30,000 people were living there at the time, for the plateau below the citadel was then part of the town. Obviously it must have been there a while to have had that population! There's more about the founding of Rennes, known then as Rhedae, in my book The Visigothic Inheritance. The church was dedicated to Mary Magdalene in 1059 by Guifred, the wicked archbishop of Narbonne. I know Guifred's story because it is connected with the village where I live. Guifred was given the post of archbishop at the age of ten, so that he could annex Languedoc for his Spanish relatives. The Vicounts of Narbonne got him expelled by the Church, he retaliated by using his wealth to build fortresses around Narbonne and thus controlled the local economy! He built in my village in 1059 a fortress on the river Aude which still exists. That was the same year that he dedicated the church at Rennes to Mary Magdalene - it was apparently previously dedicated to "Santa Maria". (But could have been Mary M of course; in the Middle Ages there was much confusion about which Mary was which.) 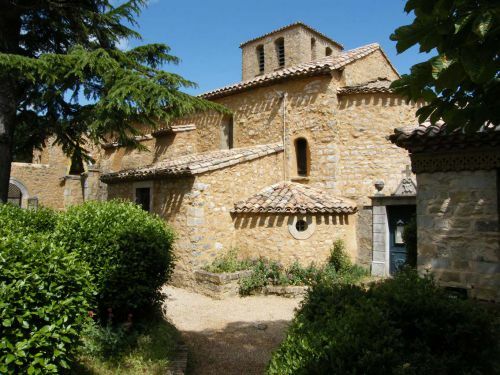 It seemed a long way to go, from Narbonne, to consecrate this church, so I looked up Guifred and found a story that in 1059 he was "on the run" and he "found sanctuary in an unconsecrated church in the Razès." So he consecrated it. In the 18th century the local aristocracy were buried in the crypt; registry entries between 1694 and 1726 still exist. It's likely that the priest who fled during the revolution, Antoine Bigou, hid some things there that Bérenger found. Ah - what things exactly? It's known that he discussed it all with his friend and bishop, Billard, and that he went to Paris some nine months later in the spring. What he found out there led him to the path he took which made him very rich. Towards the end of his life it seemed his interest in Mary Magdalene increased. He told his friends he wanted to make the village a pilgrimage centre for Mary Magdalene, "to rival Lourdes." You can follow more of Berenger's adventures by clicking here.